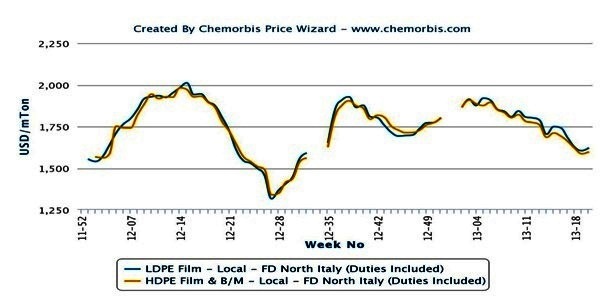 Spot PE prices in Italy began to post increases over the past two weeks for the first time since early February, putting an end to an overall decreasing trend that lasted for fifteen weeks as per the pricing service of ChemOrbis. In the midst of retreating costs and poor demand, spot PE prices were on a downward path during February, March, April and the first half of May. However, the shifting sentiment in other global markets as well as emerging supply concerns helped sellers take a firmer stance last week. 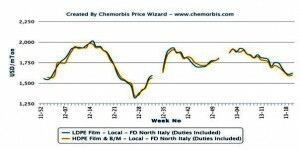 Many European producers have been running their plants at reduced rates for some time in an attempt to keep slowing demand balanced with supply. This factor has made itself felt on the market recently as many distributors also refrained from replenishing stocks in the past few months due to previously slow demand and constantly retreating prices. 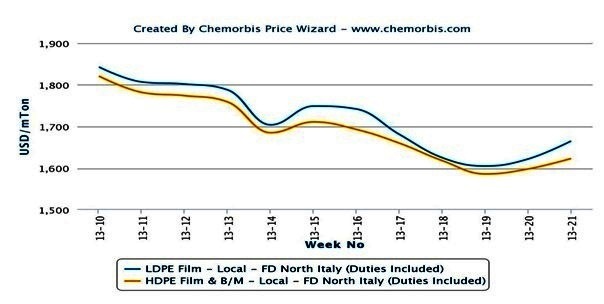 Most sellers in Italy reported achieving good PE sales in the first half of this month, while several buyers said they received less material than they ordered from their suppliers. Since the previous competitive offers disappeared last week, distributors have started to hold onto their stocks and have been sidelined from the market in anticipation of new increases on the way. Several buyers also reported their previous orders were cancelled. A packaging manufacturer commented, “As our order was cancelled, we had to accept a €20/ton increase for a Central European origin in our LDPE purchase.” He added that their end business has improved a bit recently. 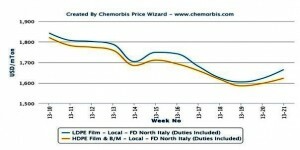 A shopping bag manufacturer also reported paying €70-90/ton increases for West European LDPE from early May. “Our end product demand is not performing so badly, but the general crisis is affecting our sales,” he noted. Some players also opine that this recent rebound in PE prices is only driven by concerns about supply while it lacks support from real demand. “There are many converters trying to pre-buy these days but market fundamentals, indeed, remain weak,” they point out.